For this week's nonscientific survey of insiders in politics and government, we asked about the power of the three leaders in the Capitol, and a ranking of who's strongest and weakest among the statewide elected officials in Texas. With a month to go before the session and many of Texas’ statewide officeholders revving their political engines for 2014, we asked the insiders about how the three leaders in the Capitol stack up, and about how they would assess the strength of the rest of the statewide elected officials. In the state Capitol, the power lines run from West to East, the insiders said, with House Speaker Joe Straus in the strongest position, Gov. Rick Perry next, and Lt. Gov. David Dewhurst in the third spot. They overwhelming think is it “very unlikely” that Straus will be ousted from the chair in the House, in spite of an open challenge from Bryan Hughes, R-Mineola, and a possible challenge from David Simpson, R-Longview. The strongest statewide officeholder in the state? 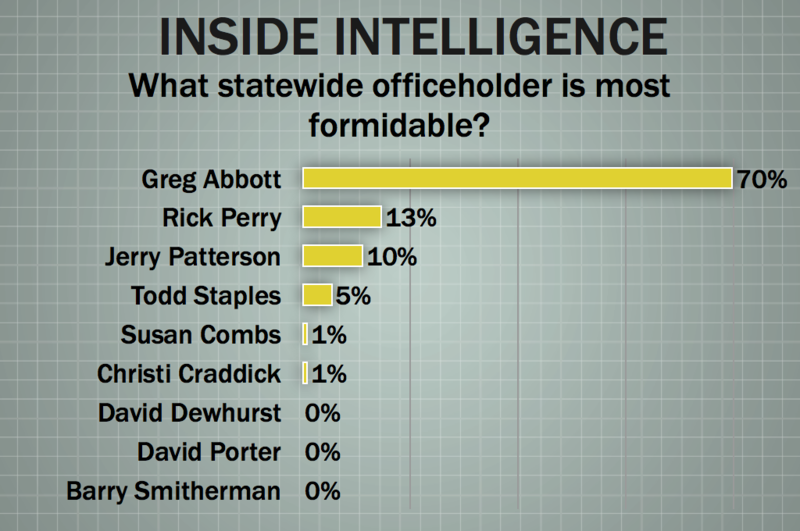 Greg Abbott, according to 71 percent of the insiders. The weakest? That would be Dewhurst, according to 50 percent, followed by Perry, at 19 percent, and Comptroller Susan Combs, at 16 percent. As always, we’ve included all of the verbatim comments to our questions in an attachment, and have a sampling below. Going into the 2013 legislative session, which of the top three leaders is in the strongest position? • "Perry typically sets the agenda and he's the most conservative of the 3." • "The Dew can't get no respect and has made all the wrong moves (i.e. you do not give those against you power). The Speaker has to deal with ideologues that do not understand how to find middle ground. So, by process of elimination, the Guv has been dealt a good hand." • "Unquestionably, Speaker Straus. 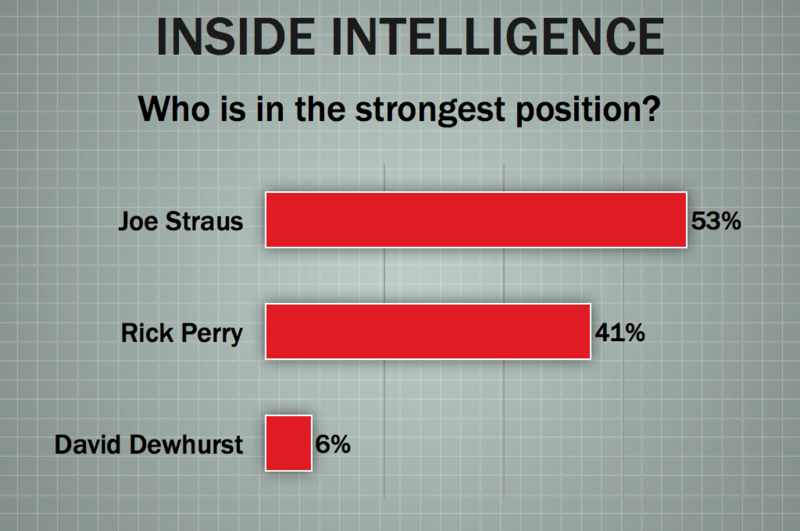 Dewhurst is wounded from the election and there's too much uncertainty surrounding Perry's future." • "Without question, Straus is the grown up in the room." • "In a one-party controlled state, Perry has the advantage of being able to channel the GOP base, without having to actually do any heavy lifting during session. He declares his emergency priorities, stirs the pot, and takes off to plow the fields of Iowa. Meanwhile, Straus and Dewhurst are left to deal with the budget shortfall, cuts to education, etc." • "Straus is the only office holder who hasn't been rebuked by the voters this year." • "When [Dewhurst] moved to the right, especially with committee chairmanships, he strengthened his hand." 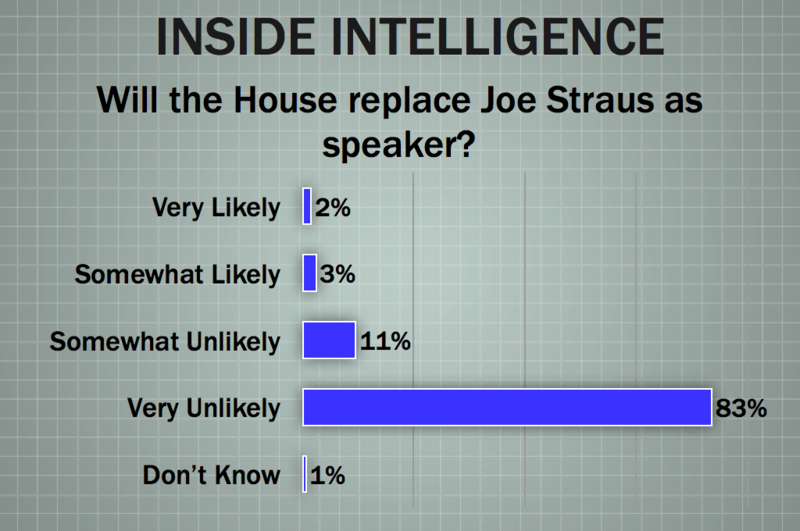 How likely are House members to replace Joe Straus as speaker in January? • "Democrats will pick the next speaker, make no mistake. Hughes may be a closet TTLA guy, but his record is to wacky to pry Dems away from Straus." • "Simpson could do it if he puts his name in the hat." • "Straus has the Speaker's race sewn up. Anyone saying something different is either on the outs with the Speaker or is seriously delusional." • "There are now a half dozen or so more Democrats than there were in 2011. Where else can they go?" • "Simpson provides some intriguing possibilities, especially with yet another huge turnover in the House." • "Anyone voting against Straus is rowing back to the Titanic hollering ‘don't go down without me’." • "The Speaker’s race is a farce; some perpetuate this notion for their own purposes. The net political effective, which is a brilliant, is to co-op the proposed rule changes by “discussing” them." • "There is no real Speaker's race." • "What is so bad with Straus? Is it really all about TSA Groping?" • "Straus has the votes." Of the current crop of statewide officeholders, who is the most formidable politically? • "Abbott=Clean image, great story of overcoming adversity, gets press when it counts on substantive issues, huge fundraiser, prosecutorial power. Wow." • "The General is the one to watch. He has played the game correctly and is in a great position both politically and financially to take on Perry." • "Smitherman has the definitive catalog of pitch perfect talking points; however Patterson is a man of the people AND he's picked the correct opponent." • "Perry's still the king in Texas. He was damaged here by his presidential run, but none of these other folks are battle-tested enough to beat him. Dewhurst was badly weakened by his primary showing vs. Cruz." • "It probably should be the A.G. but Patterson knows how to exercise political power better than Abbott." • "Perry may be damaged goods in some peoples eyes but to think he is weak would be a mistake. He can survive on residual strength alone." • "Abbott, but with this caveat: He has never been tested. He's got the war chest and the press clippings, but can he take a punch? That remains to be seen." • "George P could beat any of them however." Of the current crop of statewide officeholders, who is the most vulnerable politically? • "If Strayhorn was 'Grandma', Combs is 'Can't Get Right'. She blew the 2012-2013 revenue estimate by a country mile, which cost local schools a mint. Don't forget the data security failures. No discernable victories." • "Perry but Combs and Dewhurst are clawing for the top spot." • "This was a close call because Lt Gov. has not developed deep grass roots in either personal contacts or an organization that showed itself in the run-off election. Rick Perry was chosen based on his performance as a presidential candidate. Other than Greg Abbott, the others are not well known enough that causes some inherent vulnerability in the political arena." • "Dewhurst is making the mistake of assuming he will be acceptable to the far right if he adopts that ideology. He won't be, and he is hurting himself among moderate conservatives who realize they have to govern." • "Perry is the most vulnerable to a defeat at the polls because his political operation is like a college football team that won the championship last year and then graduated 20 seniors, i.e., he had a winning team in 2010 but they have scattered. Will they get back together? Will he recruit a new team? Whether the plan is reunite or rebuild, will they be as good? It's harder to put a team together than it looks, and at this moment he appears to be a sitting duck." • "Probably should be a tie with Dewhurst and Combs. The operative question is: who might well fall--in a re-election campaign-- to a candidate to their right in the R. primary?" • "Seems like most of these are safe because they were recently elected or are passionate in their conservatism about moving up the ladder. Combs might still be vulnerable because of the data breach SNAFU that occurred on her watch and because of her history on the Right's sacred cow--abortion. Dewhurst, on the other hand, was just embarrassed in a primary. Folks were already second-guessing his commitment to solving issues in the Texas Senate, this electoral set-back won't do anything to quiet those rumblings." 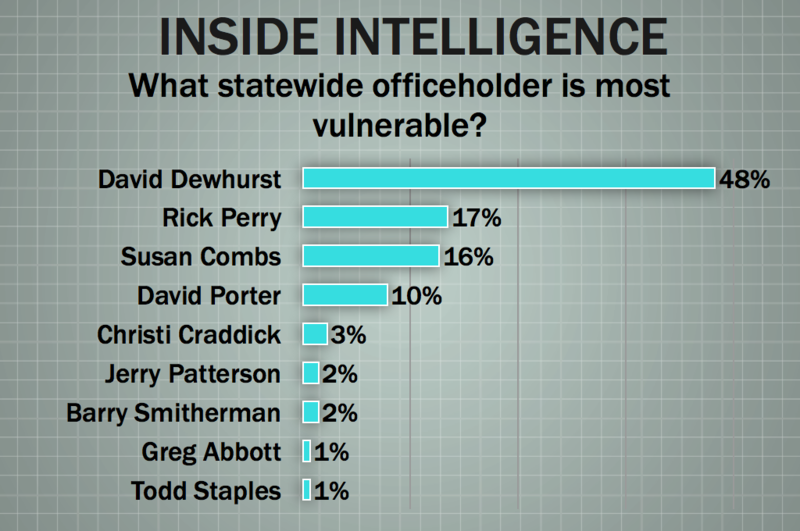 • "Hard to choose between Dewhurst and Combs…each has significant vulnerabilities; both share a self-created impediment, suspicious primary voters." • "Perry's primary losses were in lands far away. The Dewhurst defeat was in his backyard." Our thanks to this week's participants: Cathie Adams, Brandon Aghamalian, Jenny Aghamalian, Victor Alcorta, Clyde Alexander, George Allen, David Anthony, Jay Arnold, Louis Bacarisse, Charles Bailey, Tom Banning, Dave Beckwith, Amy Beneski, Rebecca Bernhardt, Andrew Biar, Allen Blakemore, Tom Blanton, Chris Britton, David Cabrales, Lydia Camarillo, Kerry Cammack, Marc Campos, Snapper Carr, Janis Carter, Corbin Casteel, William Chapman, Elizabeth Christian, Elna Christopher, Harold Cook, Beth Cubriel, Randy Cubriel, Denise Davis, Hector De Leon, Nora Del Bosque, Tom Duffy, Richard Dyer, Jeff Eller, Jack Erskine, John Esparza, Jon Fisher, Tom Forbes, Neftali Garcia, Norman Garza, Dominic Giarratani, Bruce Gibson, Stephanie Gibson, Kinnan Golemon, Daniel Gonzalez, John Greytok, Jack Gullahorn, Clint Hackney, Wayne Hamilton, Bill Hammond, Ken Hodges, Billy Howe, Shanna Igo, Deborah Ingersoll, Richie Jackson, Cal Jillson, Jason Johnson, Bill Jones, Mark Jones, Robert Jones, Lisa Kaufman, Robert Kepple, Richard Khouri, Tom Kleinworth, Pete Laney, James LeBas, Luke Legate, Leslie Lemon, Myra Leo, Ruben Longoria, Homero Lucero, Vilma Luna, Matt Mackowiak, Luke Marchant, Matt Matthews, Dan McClung, Parker McCollough, Scott McCown, Robert Miller, Bee Moorhead, Mike Moses, Steve Murdock, Craig Murphy, Keir Murray, Pat Nugent, Nef Partida, Gardner Pate, Bill Pewitt, Jerry Philips, Tom Phillips, Wayne Pierce, Richard Pineda, Allen Place, Gary Polland, Jay Pritchard, Ted Melina Raab, Bill Ratliff, Karen Reagan, Patrick Reinhart, Kim Ross, Jason Sabo, Mark Sanders, Andy Sansom, Jim Sartwelle, Stan Schlueter, Bruce Scott, Robert Scott, Steve Scurlock, Dan Shelley, Bradford Shields, Christopher Shields, Jason Skaggs, Brian Sledge, Ed Small, Martha Smiley, Todd Smith, Larry Soward, Dennis Speight, Jason Stanford, Bill Stevens, Bill Stotesbery, Keith Strama, Bob Strauser, Colin Strother, Charles Stuart, Michael Quinn Sullivan, Sherry Sylvester, Jay Thompson, Russ Tidwell, Trent Townsend, Trey Trainor, Lisa Turner, Joe Valenzuela, Ware Wendell, Darren Whitehurst, Woody Widrow, Seth Winick, Alex Winslow, Lee Woods, Peck Young, Angelo Zottarelli.